Calling all Alpha Females! 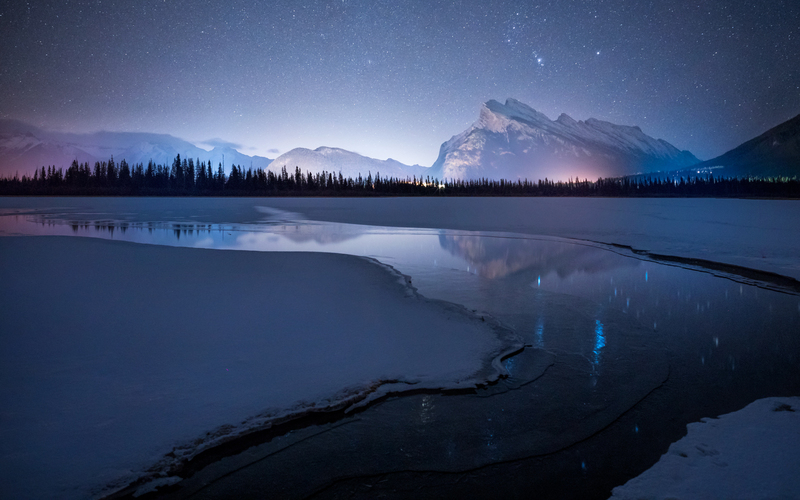 Put your adventure boots on, and join me for six unforgettable days of winter photography, learning, creativity, and collaboration in the Canadian Rockies! This workshop is designed by women for women. My goal is to build community among a group of like-minded ladies, while cultivating your skills in photography, and helping you to share your work with the world. 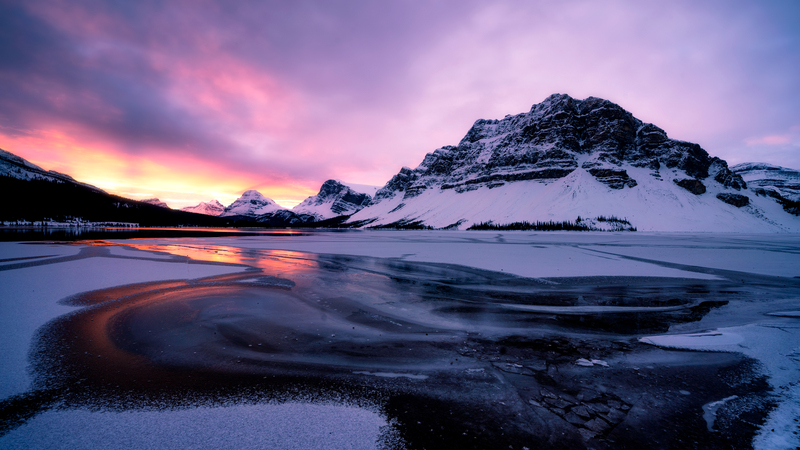 Be prepared to fall in love with winter on my Canadian Rockies Photography Workshop! 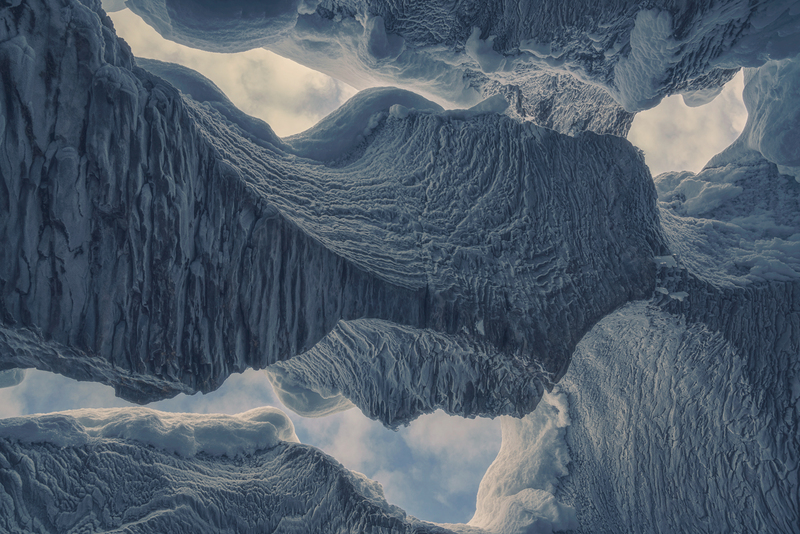 It is no secret that winter is my favourite time of year to photograph the majestic Rocky Mountains. 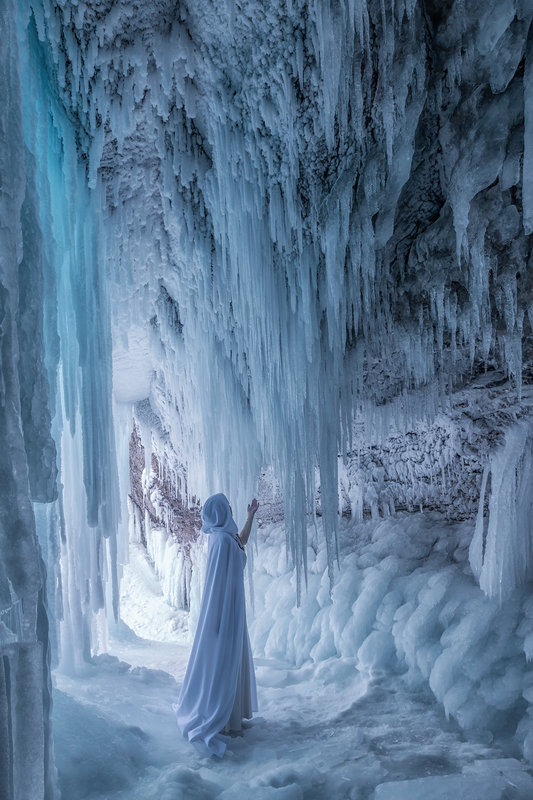 Early January is the perfect time to see some of the most amazing winter phenomena, as waterfalls are completely frozen, and the frozen methane bubbles have formed on the lakes. 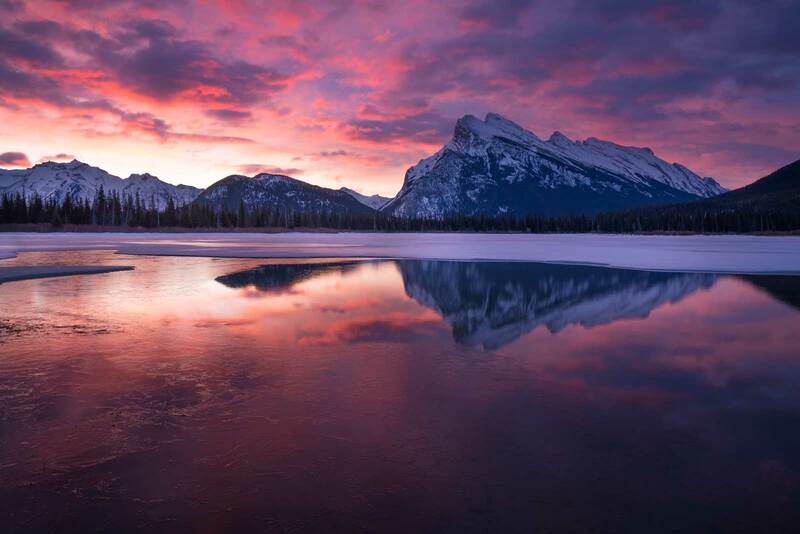 With six days to explore the Rockies you will see all of the best that Banff, Jasper, and Yoho National Parks have to offer! This workshop is designed to help you take your photography to the next level through developing your technical skills, and building your social media presence. 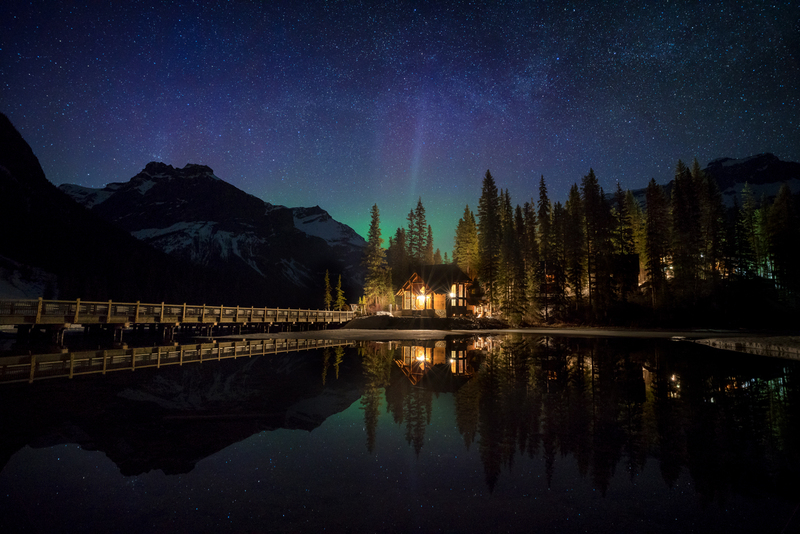 Emerald Lake Lodge – Our home base for 5 nights of adventure! 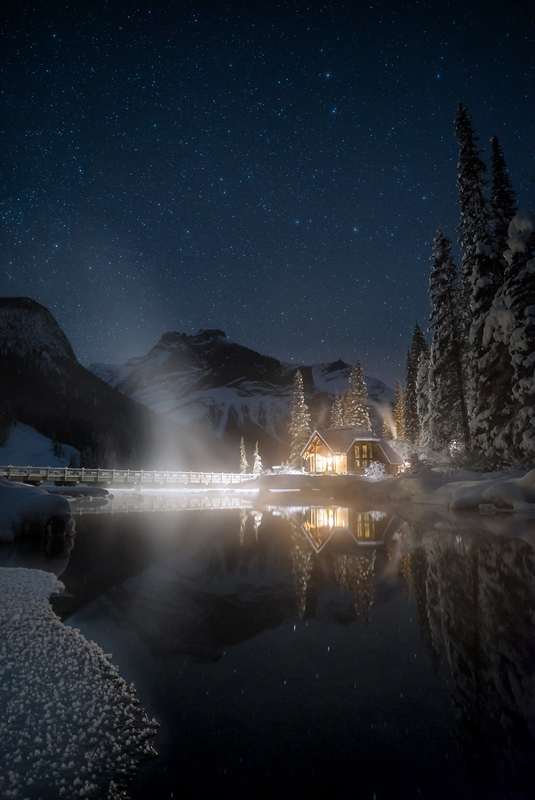 All lodging – We will be staying at the enchanting Emerald Lake Lodge for 5 nights. Each cabin is equipped with a wood burning fireplace to cozy up to after a full day of shooting. The best part about staying here is the ability to step outside of our cabin doors to get amazing shots of this quintessentially Canadian cabin on the lake. Post Processing. To get the most out of your images I will be teaching you manual exposure bracketing and focus stacking. If you typically shoot everything in a single image, and you shy away from photoshop, these easy to follow processing sessions will help you to conquer your fear of Photoshop and take your images to the next level! We can work on your favourite images from the workshop and I can show you how to edit images that will inspire others. I am happy to announce that Sony will be supporting this workshop with a variety of cameras and lenses for you to try! This is a great opportunity for you to try a full frame camera, or take a new lens for a test drive. Of course, this is totally optional: If you are not a Sony shooter, you can use your own gear, or try out a Sony camera if you want to see what all of the excitement around Sony’s mirrorless cameras is about. We are also super fortunate to have B&H photo supporting this event! With this kind of support, there really isn’t anything that we can’t create together! And, B&H always has fun surprises in store for those who are attending the workshop! You need a warm hat and a face mask (balaclava) that covers your face. Warm gloves that you can operate your camera without exposing your fingers to the cold. Big gloves are not good for getting to your camera functions. I use a touch screen liner glove inside of a wind proof mitten. 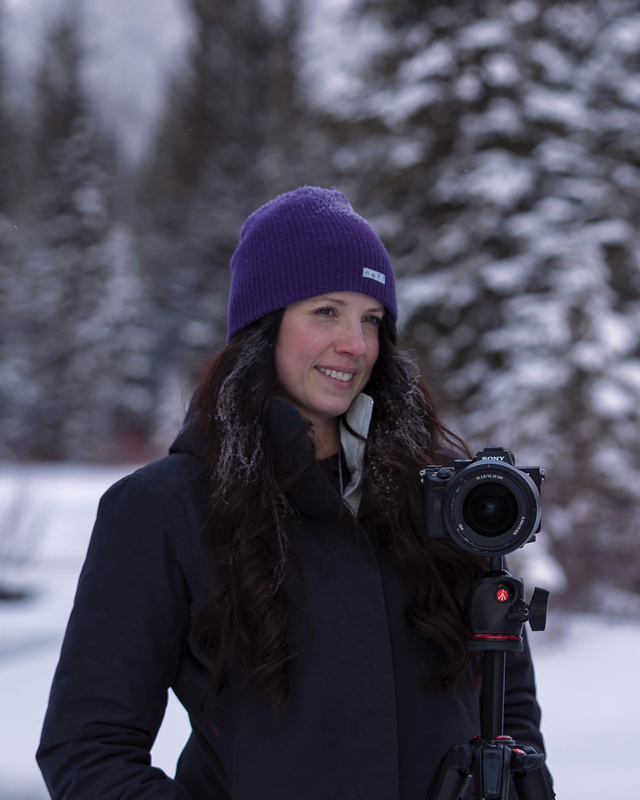 This mitten folds back to hug reveal the inner glove so you can operate your camera. Both the inner glove and the mitten have room for chemical hand warmers.I HIGHLY RECOMMEND getting a pair of these mittens and liners. I have never had frostbite on my hands and I have worked in temperatures near – 40 Celsius! You can get them at B&H Photo using this link. They will arrive in two days (even to Canada). I recommend three layers to keep you toasty warm during our adventures. First, a thermal layer, such as Merino wool. This type of fabric keeps you warm and dries quickly. Second, a fleece layer. Fleece is very insulating. Finally, outer wear that blocks wind. A winter jacket and ski pants will be perfect. Chemical warmers. Get chemical warmers for your mittens and boots. For foot warmers, I prefer the insole style to the toe warmers. Winter boots. Your boots should be rated for cold weather. My boots are rated for temperatures as low as -50 Celsius but my feet still get cold sometimes. Regular hiking boots DO NOT provide adequate protection. Micro spikes. You will need micro spikes that slip on over your boots for getting around on the ice. Please be sure to try them on with your boots before arriving. Please note, the diamond style grips are NOT sufficient for getting down to the ice at Abraham Lake. Rain sleeve for your camera. The disposable sleeves are fine. I don’t expect it to rain during your stay, but it will likely snow. The rain sleeve will protect your camera from moisture. ***STURDY TRIPOD*** I can’t even tell you how many tripod issues I encounter on every workshop. 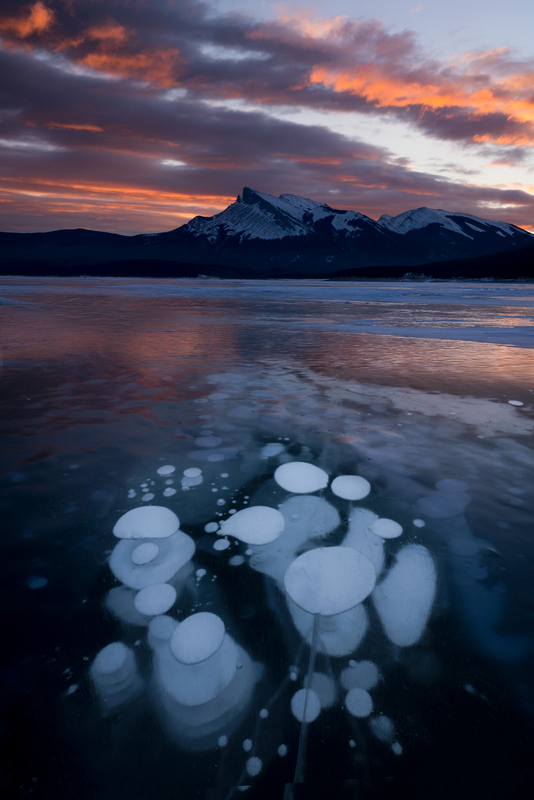 You will be shooting in strong winds at Abraham Lake. You need a tripod that isn’t at risk of blowing over when you mount your camera and lens on it. You will want it to get low (within a few inches of the ice). Mefoto and the ManFrotto BeFree tripods are NOT SUFFICIENT. I use a Slik USA carbon fibre 734 with an SBH 200 DQ Ball Head. It is lightweight but sturdy and it gets low. This tripod has been all over the world with me and has worked reliably at every shooting location. SLIK has graciously extended a 15% discount to workshop attendees if you need to upgrade your current gear. Use the code RJR15. Wide Angle Lens. The Rocky Mountains are imposing peaks that fill the frame of a wide angle lens. I use a Sony 16-35 mm f/2.8 G Master, and a Sony 12-24 mm f/4. If you don’t currently own a wide angle lens, you will need to rent one for the trip. Cloth grocery bag or super lightweight duffel bag to hold your warm gear and snacks. 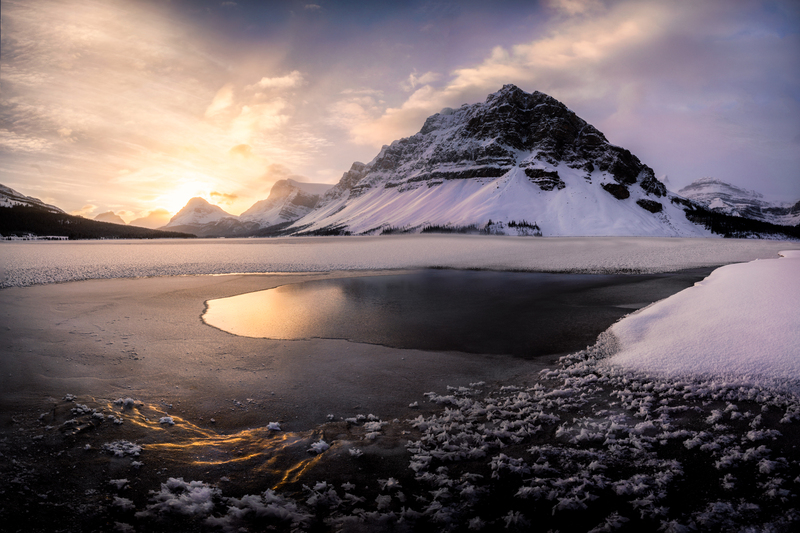 This workshop will have a flexible itinerary that will allow us to seek out the best light. Emerald Lake Lodge is fairy central between Banff, Lake Louise, and some of my favourite shooting locations along the Icefields Parkway. 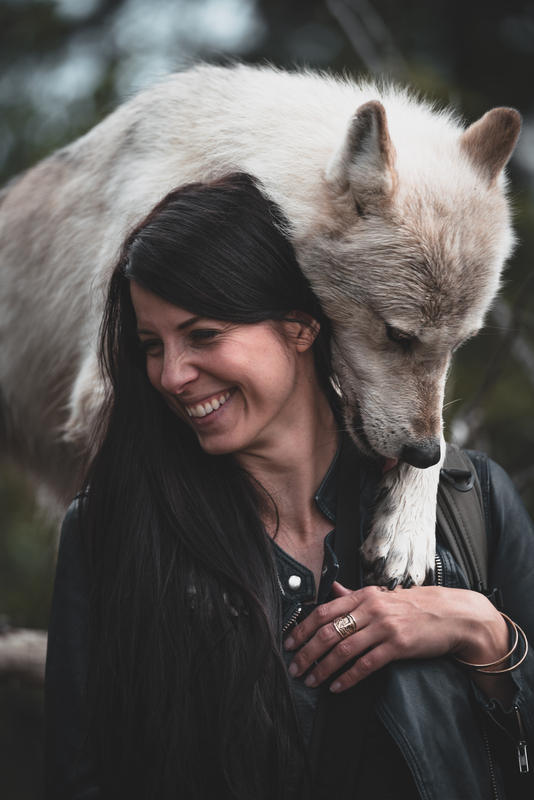 We will also be visiting the Northern Lights Wildlife Centre to photograph and hike with wolves! This is a unique experience that will stretch our photography skills as we trade tripods and wide angle lenses for fast shutters and long lenses. We will walk alongside the wolves as they explore the mountain valley in search of new smells, and photograph them in the wild. We will keep our eye on the aurora forecast as the winter months produce some of the most amazing Northern Lights displays! If we are lucky enough to catch the dancing green lights, they will be visible outside our cabin doors! My name is Rachel Jones Ross. I am extremely lucky to call the Canadian Rockies home. I love winter so much that I don’t generally plan any travel between November and February. I have a Master of Science in psychology, and I taught in college and university before making the move to teaching photography full time. 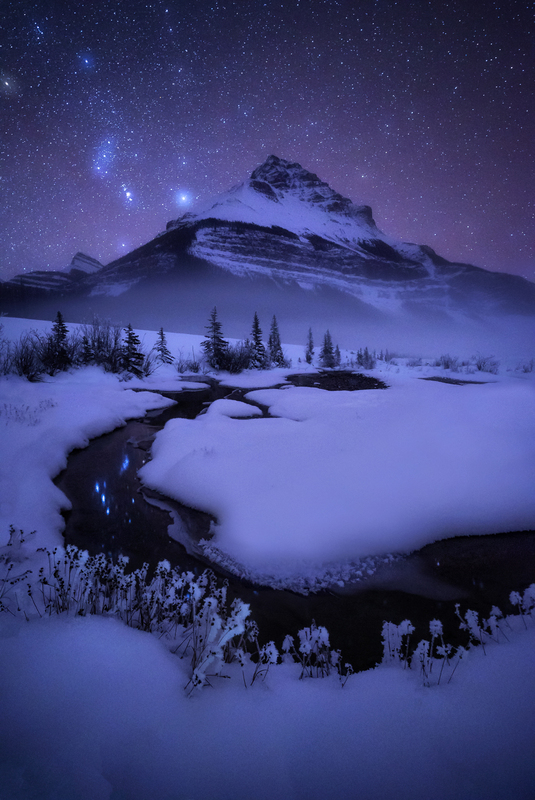 I love landscape and astro photography, but I get most excited when I can create stories with my images! Accommodations are based on shared occupancy. I highly recommend flying in the night before the workshop starts, as winter weather can be unpredictable and flights can be delayed or cancelled. The total cost of the workshop is $2950 (USD). A deposit of $950 is required to hold your spot. Deposits are non-refundable. New! I have also just opened up 5 spots for a fall Ladies Retreat! If the winter weather does not appeal to you, there is a warmer option! I will be hosting an autumn workshop in the Rockies from September 8th to 13th, 2019. Please don’t hesitate to reach out with any questions. You can contact me using the form at the bottom of the page.